Home News Automobiles Clash Of Segments: Mahindra Marazzo vs Honda City – Which Car To Buy? Clash Of Segments: Mahindra Marazzo vs Honda City – Which Car To Buy? The Marazzo, Mahindra’s latest entry in the MPV space, has been priced aggressively, slotting in between the Ertiga and the Innova Crysta. Speaking of pricing and rivals, the Marazzo also overlaps with another popular car in the Indian market, the Honda City. Prices of the Marazzo start from R 9.99 lakh and go up to Rs 13.90 lakh (ex-showroom pan India). The Honda City’s prices, on the other hand, range from Rs 8.77 to Rs 13.93 lakh (ex-showroom Delhi). There is a big band where prices of the two overlap. And as the Marazzo is only available with a diesel-manual, we compare three similar variants of the two to find out which one is the better option. Let’s have a look at the the basic differences between the two cars first. An MPV: The Marazzo is a body-on-frame people-mover. It can seat a maximum of seven people in three rows. A sedan: The City is a traditional three-box sedan. It can seat a maximum of five people. Given its unibody construction against the Marazzo’s body-on-frame and its overall exterior design, the City should be a more engaging car to drive. Engine: The Marazzo’s 1.5-litre diesel engine is good for 121PS power and 300Nm of torque. It can be had with a manual transmission only. Engine: The City’s diesel engine, though similarly sized, makes only 98.6PS and 200Nm of torque. The diesel City is also available with a manual transmission only. Ground Clearance: The Marazzo being an MPV has a ground clearanceof more than 200mm. That should make it more adept at handling bad roads of our country. Ground Clearance: The City is a low-slung sedan and only has 165mm of ground clearance. That reduces its capability of handling bad roads. Segment Competition: The Marazzo sits in the gap between India’s two most popular MPVs, the Ertiga and Innova Crysta. It competes with top-end models of the Ertiga and also the base variants of the Innova Crysta. Segment Competition: The City is a compact sedan that fights for market share in a segment with players like the Hyundai Verna and Maruti Suzuki Ciaz. Verdict – While the Honda City is a bit more expensive than the Mahindra Marazzo, it also offers important features like automatic climate control and power-folding ORVMs that make living with it easier. In our opinion, it is the better pick of the two. 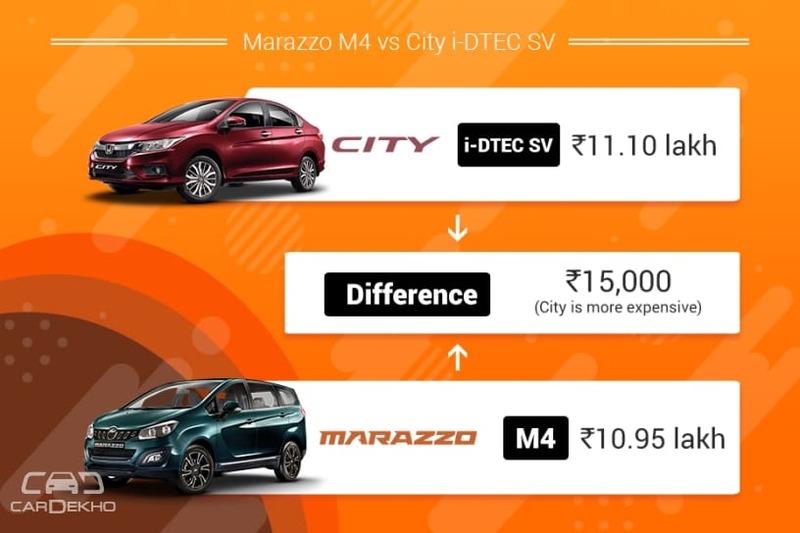 Verdict – The City again edges slightly ahead in the features department but it steers way ahead of the Marazzo by being more affordable by Rs 51,000. Moreover, rear parking sensors can be fitted post purchase, so you’ll be missing fewer features in the City compared to the Marazzo. Verdict – It’s a comprehensive victory for the City once again. Despite being more affordable by Rs 2,000, the City’s ZX variant offers more crucial features like six airbags and electric sunroof. For ferrying more passengers: The Marazzo MPV can be had with a 7- or 8-seater layout. So if you have a big family and you often go out together or just need a vehicle for the days when you want to go out together, pick the Marazzo. For those who’re chauffeur-driven: If you don’t drive too often and have a driver to do that, you can buy the 7-seater Marazzo which has captain seats in the middle. These should ideally be more comfortable than bench seats on offer in the City. More practical: Considering our road conditions, the Marazzo can be taken further off the beaten path than the City. Being an MPV, it can also be used to lug unusually big items. Getting in and out of the Marazzo should also be easier in comparison to the City where you’ll always have to stoop to get in. Loaded with features: Compared to the Marazzo, the City is loaded with features. All three variant comparisons done by us point to this. And the fact that the City undercuts the price of the Marazzo in two of the three comparisons, just makes it a sweeter deal. More engaging to drive: The City, being a sedan is closer to the ground. This results in a lower centre of gravity, which should in turn lead to better handling characteristics. Also, its unibody construction should further improve its handling dynamics.